Parastomal hernia formation, the presence of visceral contents protruding through an abdominal wall defect adjacent to an ostomy, represents a complex problem for the hernia surgeon. When compared to other types of ventral hernias, they occur at a higher rate, they are technically more difficult to repair, and they are associated with higher rates of surgical site occurrences and hernia recurrences. Recent reviews suggest that hernia formation complicates up to 50 % of stoma formation [1–6]. The presence of a parastomal hernia also increases the likelihood of a concomitant incisional hernia formation, which further complicates the repair of both hernias [7, 8]. 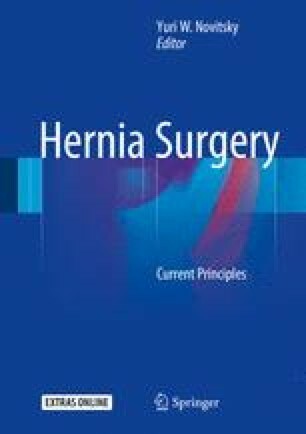 Parastomal hernias have additional morbidity not associated with other hernias including poorly fitting stoma appliances, parastomal skin breakdown, stoma level obstruction, and pain which result in an overall negative impact on quality of life . This chapter will provide an overview of the various types of open repair of parastomal hernias. The online version of this chapter (doi: 10.1007/978-3-319-27470-6_17) contains supplementary material, which is available to authorized users.